PKSF has been implementing the LIFT since 2006 to encourage and patronise innovative financial and non-financial initiatives, which are intended to benefit the poor through improvement of their livelihood, generation of sustainable environment and development of health and education, and by helping develop new tools for poverty eradication. The LIFT fund is open for both Partner and non-Partner Organizations in order to experiment and implement pro-poor innovative ideas on a large scale. The PKSF uses an innovation matrix to classify innovation and evaluate LIFT proposals. The LIFT fund is disbursed among project implementing organisations both as loans and grants on the basis of the nature of the involved projects. Some of the LIFT initiatives have had remarkable impacts on sustainable economic growth of the extreme poor. The LIFT has helped a large number of extreme poor people in the haors of Kishoreganj and Netrakona districts gain access to financial services. This initiative has yielded a haor-centric specialised loan product that brought over 22,000 ultra-poor members under financial services. Loans for scientific rearing of Black Bengal goats is another specialized initiative introduced by the LIFT. This initiative has helped conserve genetic resources of the Black Bengal goat variety and generated sustainable livelihood for about 65,000 poor members of 12 POs throughout the country. Char land lease loan for the extreme poor of the char and remote areas is a successful loan product of the LIFT. It has strengthened the capacity of about 67,000 ultra-poor members to fight against extreme poverty by ensuring self-employment opportunities and food security for them. Financing the poor household based eel fish farming is another successful intervention of the LIFT. Farming of eel-fish, locally known as kuchia, has a substantial demand in local, national and international markets, and kuchia farmers are making handsome profits from this. Under the LIFT, sixteen POs are so far engaged with the activity of eel fish farming. Through six POs and a non-PO, the LIFT has introduced specialised contract dairy farming by farmers. High-yielding native and crossbred lactating dairy cows (with calves) are distributed among poor and ultra-poor households on contract-farming basis. Under this initiative, the POs provide technical counselling on day-to-day farm management, feeds and feeding management, fodder production and conservation technology, veterinary care and breeding support (artificial insemination), farm-waste management and training on scientific dairying to the contract farmers. This has yielded a sustainable dairy production model with potential for further replication in similar agro-ecological conditions across the country. Promotion of turkey farming technology is a promising poultry-related initiative being implemented under LIFT. Under this initiative public extension services, training for farmers, research on turkey and identifying marketing strategies are being implemented to improve the turkey production both at the institution and the farmer levels. At present, a turkey parent-stock farm with a hatching unit has been established in Komolganj of Moulvibazar district. Besides, farmers of Komolganj are rearing turkeys at the household level especially for meat in a sustainable way. PKSF has already taken an initiative to expand turkey farms among the members of eleven POs and a non-PO throughout the country. 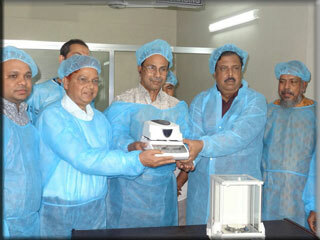 The LIFT has introduced the farmers of coastal areas to salinity-tolerant rice seeds. This initiative made remarkable progress in ensuring quality salinity-tolerant rice seeds for the coastal-farmers. In view of its success, PKSF has taken another initiative to expand distribution of drought-tolerant variety of rice seeds among the farmers of Chuadanga. 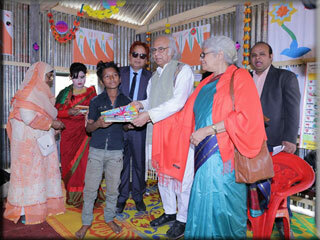 The LIFT has introduced inclusive financing, capacity building and social awareness advocacy programme for the poor people with disability in Sitakunda of Chittagong and Saghata in Gaibandha. It also introduced a programme titled ‘Improving Elderly People’s Livelihood through Community Initiative’ in Munshiganj. Under this initiative, poor elderly people are being provided with financial services, capacity building training and healthcare services. 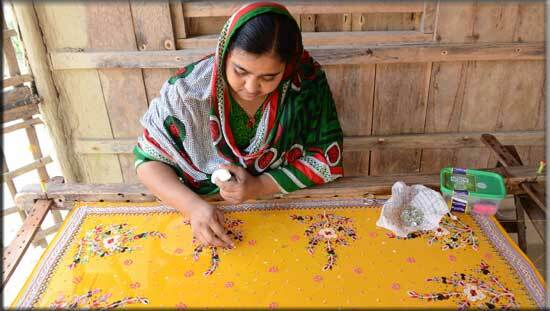 Besides, the LIFT is implementing inclusive development programme for the gipsycommunity (Bedey) of Savar. Development of poor-friendly and craft-based enterprises for the extreme poor is another successful poverty mitigation measure of the LIFT. Production and marketing of export-oriented Omanian caps have created wage-employment for thousands of monga-affected households in Gaibandha and those living in the cyclone Aila and Sidr-affected coastal region of Bangladesh. The PKSF is extensively working to address the crisis of potable water among the coastal poor. 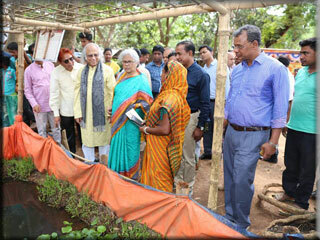 In this regard, PKSF has already distributed 2,000 rainwater harvesting tanks among the coastal poor through nine POs. Besides, it established 21 desalination plants by 12 POs under the LIFT for the continuous supply of low-cost potable water for them. The PKSF has completed a study on ‘Innovative Solutions to Sustaining Access to Safe Drinking Water for the Poor in the Salinity-prone Coastal Belt’ through the Institute for Inclusive Finance and Development (InM). The study reflects demand and opportunities for setting up more desalination plants throughout the coastal region. PKSF has taken a number of new initiatives on cluster based high-value indigenous fish culture, integrated alternative occupation of ethnic communities, skill and capacity development of under-privileged girls in hoar area, modern technology-based integrated farming in hilly area, expansion of high meat-yielding beef cattle rearing, extension of high-yielding varieties of quail, expansion of fat-tailed sheep (Dumba)farming technology, collection and marketing pituitary glands of fishes, aqua-ponic and hydro-ponic gardening, integrated farming of fish and snail etc. Some of these initiatives are already being implemented while some are in the design phase. PKSF launched Programmed Initiatives for Monga Eradication (PRIME) in 2006 to address the distress of people affected by Monga and Monga-like situations. The programme was designed to be implemented in the north-western region of Bangladesh which faces acute hunger during the pre-harvest months of October-December. This period locally known as Monga is characterized by minimal access to food and a dearth of earning opportunities for the landless and wage labourers in the region. From 2010, PRIME started working in the natural disaster-prone south-western region which were earlier hit by cyclone and other calamities and had been suffering from water salinity and acute poverty. The primary focus of PRIME is to create wage-employment and self-employment opportunities for the Monga-affected people to ensure their income throughout the year. Therefore, the objective of PRIME is to fight the adverse consequences of Monga in the north and Monga-like situations in the south as well as to enhance the capability of the ultra poor to cope up with its economic hardships in short-term while help alleviate poverty in the long term. PRIME delivers holistic package of financial and non-financial services through seven components; namely group formation; provision of Flexible Microcredit (FMC); provision of Emergency Loan (EL); technical services; skill development/vocational training; primary health-care services and disaster management. The working area of PRIME comprises35 upazilas of Rangpur, Lalmonirhat, Nilphamari, Kurigram and Gaibandha districts of northern region; 12 upazilas of Satkhira, Khulna and Barisal and Barguna of south-western region and 3 upazilas of Jamalpur of north-eastern region. 24 Partner Organisations (POs) were selected for the implementation of PRIME, 13 POs from northwest region and 14 POs from southwest & northeast region. PRIME is being operated through 202 branches in the north and 107 branches in the south of Bangladesh and at Jamalpur. The extreme poverty focused PRIME programme completed its 1st phase in June 2016 covering 0.51 million ultra poor HHs in the north-western, south-western and north-eastern region of Bangladesh. Both field-level observations and independent evaluations revealed that over the last nine years, PRIME has made significant positive impact on employment, income, food-security, social integration and resilience to different kinds of shocks of the ultra poor households. Longitudinal impact studies on PRIME by the Institute of Microfinance (InM) also show that PRIME model is an effective tool for reducing both economic and multi-dimensional poverty of extreme poor living in the most vulnerable location of the country. PRIME has resulted increase in annual income of the targeted households from Tk. 37,000 in 2008 to Tk.1,42,638 in 2016; food security remarkably increased from merely 4% only in 2007 to 99% in 2016 during Monga period; monthly working days during the Monga period in 2007 was virtually non-existent but now increased to average 20 days/month (269 days/year) for each household; and the total family assets (savings and physical assets) also increased significantly by 240% from Tk.61,700 in 2008 to Tk.211,000 in 2016. PRIME has a significant contribution in Monga eradication in Rangpur Division. It has also reduced the vulnerability of AILA and SIDR affected extreme poor of south-western coastal areas. The Multi-dimensional Poverty Index (MPI) of PRIME households was 40% less (0.25 Vs 0.41) than that of non-PRIME extreme poor. Women from PRIME HHs were significantly more empowered (0.96 Vs 0.39) than the non-PRIME control extreme poor. Human dignity was significantly higher (latest score 4.19 Vs 3.65) in PRIME HHs than those of non-PRIME. Nutritional status of under-5 children and women of child bearing age of PRIME HHs were quite comparable to that of the national data. Recent study by the DFID showed that PRIME is the least costly and yet most effective extreme poverty programme of Bangladesh. Extreme poor should be properly targeted with standard key elements of extreme poor characteristics. Extreme poor are not homogenous group in their characteristics; they differ in their human capacity, financial/asset base, access to market, geographic/climatic vulnerability and social capital. The programme should response to this aspect of extreme poor characteristics. Financial services alone are insufficient for the extreme poor they need sustained financial, technical and generic human capital investments. Extreme poor need long term (at least 4-5 years) programme support for sustainable graduation out of extreme poverty. Farming related, more specifically livestock based intervention should get priority as livelihood option. Enterprise development should be the aim. Extreme poor should have diversified income sources (both farming and non-farm) so to reduce their vulnerability and increase their resilience especially in climatically challenged conditions. Helping extreme poor to make markets work better for them is a big challenge due to accessibility and quality compliances. Extreme poverty programme should not target threshold graduation rather it should aim for family based sustainable graduation programme. Extreme poverty programme not necessarily have to be very costly but at the same time costs should be considered as a component of public social service provision for extreme poor up to a ‘sustainable graduation’. Hers is not a story of merely struggling through poverty and achieving solvency in life; nor is it an over-glorified tale of success that development workers often enjoy sharing to exhibit the purported effectiveness of their activities. Munira’s story is sewn with sufferings, painted with plights, saturated with sorrows and soaked in tears; it is a tale of her unbending willpower, indomitable spirits, relentless hard work and the eventual smile of victory against a life marked by excruciating poverty. 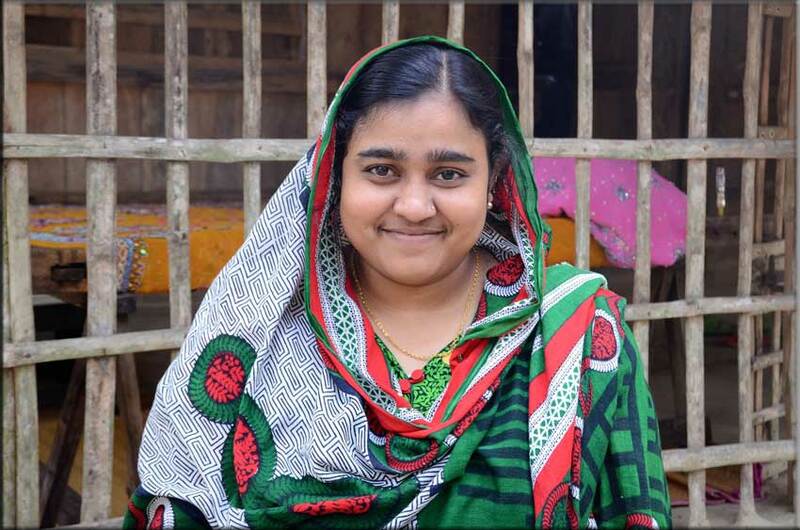 Her full name is Munira Akter Maya, now a confident 24-year-old woman, mother of a fourth-grader son, and torchbearer for her husband Maruf Hossain Biplob, 38, who once lost his way and would probably have to forever live in disgrace hadn’t Maya stood so firm against all odds. “He borrowed about Tk 5 lakh to go abroad for work. 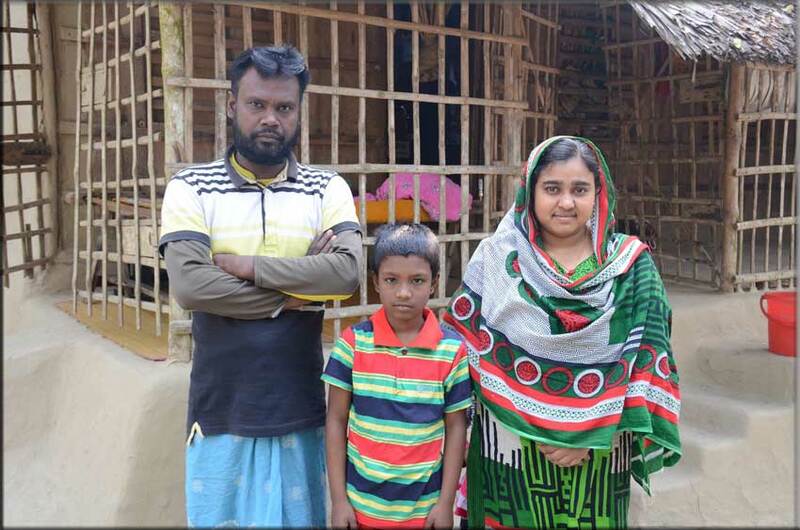 But he was conned out of everything by some unscrupulous overseas manpower traders,” Munira said as we were sitting at the tiny front yard of her house in Haybatpur, a small village under Shyamnagar upazila some 60km from the Satkhira district town in Southern Bangladesh. The Indian border was only a few kilometres from her house. “And then began our real nightmares. The money-lenders would come to us day and night wanting money. Unruly as they were, they would often threaten us with consequences. But where could we find so much money? … At one stage, my husband fled to India to save himself. This left me in a worse situation. When she joined the PRIME, her monthly income was around Tk 1,500 which she would make by rearing chickens and working as a maid. Within a year, she became a trainer under the PRIME and started earning around Tk 14,000 each month. “At the same time, I would work on designing and embroidering sarees at night”. Motorcycles are very popular among commuters in southern Bangladesh. The communication infrastructure there is so poor that four-wheelers cannot operate outside the main towns. Hence, motorcycles are hired, much like the taxis, for travelling from one village to another or to the town areas. “We had no land. We used to live in a tiny rented house. A few years ago, I bought this piece of three-decimal land with my own income and constructed this house. I have a home now,” Maya said, pointing to her two-room wooden house on a mud platform. On the veranda was a square wooden frame with a bright yellow georgette saree strung on it. As we asked what it was for, Maya said she was working on a new saree and explained how it is done. Her growing economic strength has also resulted in her empowerment. “All my relatives, who used to ignore me in the past, now seek advice from me before planning something. They value my opinion. My husband respects my decisions. Even those money-lenders, who once would treat me like a lesser human, gives me ‘Salaam’ when they see me,” said a beaming Munira, whose Arabic name itself means ‘luminous’.